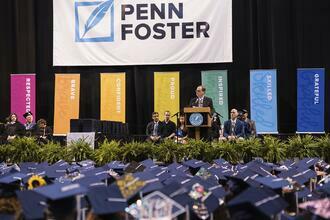 This past weekend’s Penn Foster Graduation Ceremony was, as always, one of the most moving days of the year for me. And as I watched several hundred Penn Foster graduates leave the stage with diploma, certificate or degree in hand, I felt not only a great sense of optimism for them individually, but also for them as a group. The reason? More so than in any of my prior six Penn Foster graduations, our graduates will be entering a job market anxious for credentialed learners that have already demonstrated the hallmarks of high potential professionals in terms of discipline, resilience, and commitment to growing investment in skills attainment. The Bureau of Labor Statistics’ numbers, out last Friday, affirm the story. The U.S. added 223,000 jobs in May, on top of the 164,000 added in April. The unemployment rate edged down to 3.8%, the lowest in nearly 40 years. Both numbers exceeded expectations of Wall Street economists and, as we’ve come to learn, the “exceeding of expectations” is sometimes more important than the numbers themselves. At Penn Foster, we watch these job numbers every month with great interest. That’s because we’re all about bridging the gap between education and economic opportunity. When we provide affordable diploma, certificate and degree programs, we know they are not an end in themselves. We know that we must also help individuals to develop the skills they need to pursue purposeful and productive careers. Last Saturday, of course, was all about graduation. It’s worth noting that so many Penn Foster graduates requested to receive their diplomas in person this year that the event was moved to a larger venue, the Mohegan Sun Arena in Wilkes-Barre Township, PA, not far from our Scranton headquarters. This year’s commencement honored more than 550 graduates, some who traveled from as far as Washington State for the event, and was witnessed by an estimated 1,430 family members and supporters. This crowd of approximately 2,000 was treated to a stellar and impactful keynote address from YouthBuild CEO, John Valverde, as well as an outstanding musical performance by Quintavious Johnson, a 2014 finalist on America’s Got Talent. Valverde joined YouthBuild in 2017 after decades of work as an advocate for creating access to opportunity and removing barriers to forge positive paths. He offered graduates a message of creating meaningful and productive lives for themselves and their families, while giving their energies to improve the world around them. Following his great success on America’s Got Talent, Johnson enrolled in Penn Foster High School to fulfill his high school requirements while juggling a non-stop travel and singing schedule. Not only did Johnson receive his diploma, but he treated attendees to special music he selected to honor his fellow graduates. I have had the good fortune of being at Penn Foster for six years. This experience has taught me many lessons, often left me humbled, and most often prideful when I think about the students we serve. And never more so than at this year’s Penn Foster graduation. To watch the graduation in its entirety, click here.